Newt Gingrich Forced to Go to ‘Spouse School’His wife, Callista, is going to be the U.S. Ambassador to the Vatican. 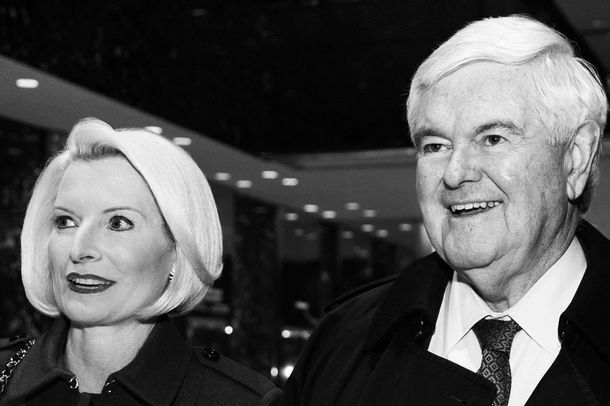 Newt: Callista Gingrich Could Be Ambassador to VaticanNewt couldn’t make it into the Trump administration but his wife may be able to. This Newt Gingrich Interview Will Give You a Mental Image You Can Never UnseeYou’ve been warned. What Callista Looked Like Before ‘The Callista’Just another politician’s wife. ‘But What Is This Crash Helmet?’ The French have learned about Callista Gingrich. What Newt’s Open Marriage Request Does to the Callista Fairy TaleProbably not good things. Did Newt’s Other Wives Brush His Teeth for Him?Seems reasonable. Newt Gingrich Refuses to Share His Calamari: The Secret TapesThere was once a time when Newt Gingrich would not share his calamari. Brave Woman Tries to Replicate Callista Gingrich’s HairIt was very difficult. Gingrich Likens Himself to FDRTotally the way to win over GOP voters. Newt Gingrich, ‘Cultural Teacher,’ Is Also Campaigning to Sell BooksThe new front-runner is still a businessman on the trail. Why the GOP Base Accepts Newt and Callista’s Unconventional, Modern MarriageIt all begins with the French horn. GOP Wives Form Clique, Exclude Less Cool WivesMary Kaye, Callista, and Anita are kind of a big deal. Things We Learned About Callista GingrichShe bowled a 200.